The plight of Syrian refugees captivated the world's attention last week after many media outlets printed the heartbreaking image of the drowned three-year-old Aylan Kurdi. More than 11 million people have been affected by the civil war in Syria - the biggest humanitarian crisis this century. As EU leaders outlined and developed their policies around the refugee crisis over the past few days, their comms have been heavily scrutinised – and have had substantial impact on their standing within their own country, the EU and the watching world. Germany is arguably the most powerful nation is Europe and its leader, Angela Merkel, has seen her reputation boosted immensely thanks to an inclusive and compassionate response, saying that Germany would not place legal limits on the number of people seeking asylum from conflict. "The right to political asylum has no limits on the number of asylum seekers," Merkel told the Funke consortium of newspapers. "As a strong, economically healthy country, we have the strength to do what is necessary and ensure every asylum seeker gets a fair hearing." 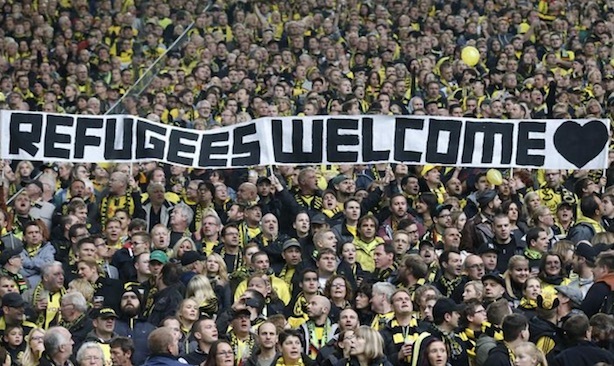 Germany is expected to welcome 800,000 refugees this year, the most of all European countries. This pro-refugee policy has been applauded worldwide - and the Chancellor has affectionately been dubbed ‘Mama Merkel’ on social media. Within Germany, her government has also pledged to create 10,000 new jobs for civil servants to process asylum applications and 3,000 additional jobs for police to deal with the crisis. The German population has also demonstrated significant sympathy towards migrants, while its most successful football team Bayern Munich has also announced a programme to work with refugees. Sweden has echoed the approach of Germany with thousands of citizens taking part in a pro-refugee demonstration in Stockholm on Sunday. Although not a household name, Prime Minister Stefan Löfven has won praise for his inspiring speech at the pro-refugee rally. "Today is not the day to point fingers, it's the time to find solutions. This is the Sweden that I lead, and this is the Sweden I love." Swedish PM Stefan Lofven is speaking at an open air public meeting to welcome refugees. Couldn't be more different to UK reaction. Sweden has received more asylum seekers per capita than any other nation in Europe, offering refuge to 81,000 people in 2014 – only second behind Germany. Löfven has also gone on record as stating the EU should do more to help. The Prime Minister already made a faux-pas when he likened Calais migrants to 'swarms' during an interview earlier this summer, but had a carefully crafted speech to address the Syrian crisis. Addressing the House of Commons on Monday, he said Britain should fulfil its "moral responsibility" to help refugees. Cameron announced that the UK would accept 20,000 refugees over the next five years with priority being given to vulnerable children and orphans. Despite the announcement, the PM is facing criticism for not having gone far enough, soon enough. Former Lib Dem leader Paddy Ashdown claimed that the Cameron had been "taught an excruciating lesson in compassion, decency and leadership by Angela Merkel". In a comment piece for The Guardian he wrote: "Not only is he offering a derisory number of places for refugees, but the Prime Minister chooses to help those who are already safely housed and fed in refugee camps outside Europe, rather than those who suffer (and die too) for want of these things inside Europe." Important PM changed mind - but not enough to take 20,000 refugees over 5 years when crisis is now. And must act on crisis in Europe too. In a bold move, the French President has admitted the country had not done enough so far, and pledged to take in 24,000 refugees despite polls showing that 55 per cent of citizens oppose admitting more refugees or relaxing asylum procedures. Hollande has also used the crisis as a political power play, saying that the UK must take its fair share of refugees if it wants support to renegotiate its position in the EU. He said: "On the issue of refugees, it’s true that Britain is not in the [passport-free] Schengen zone and has a certain number of capabilities that are different to Europe. But that doesn’t exempt it – and David Cameron has said this himself – from making an effort in terms of solidarity," he said in a press conference at the Elysée Palace on Monday. "In Calais, these are people who are not looking for asylum in France but to go the UK. Everyone must understand that you can't demand solidarity when there's a problem and shirk your duties when there are solutions." Any backlash against Hollande at home or abroad is unlikely to matter in the long run as he has hinted he will not run for re-election in 2017. The outspoken Prime Minister of Hungary has been dubbed the "black sheep" of Europe. Hungary is in a unique position as a through route for refugee to countries such as Germany, Sweden, France and the UK. Among his many controversial comments, Orban has said: "Europe’s response is madness. We must acknowledge that the European Union’s misguided immigration policy is responsible for this situation." He has also claimed the crisis is a "German problem" that migrants should "stop coming" and the mainly Muslim migrants are a threat to Europe’s Christian civilisation. Orban's view was directly challenged by President of the European Council Donald Tusk. During a joint press conference, Tusk said: "I want to underline that, for me, Christianity in public and social life means a duty to our brothers in need. Referring to Christianity in a public debate on migration must mean in the first place a readiness to show solidarity and sacrifice. For a Christian, it shouldn’t matter what race, religion and nationality the person in need represents." Across social media, Orban has been heavily criticised for his right-wing views. The greatest threat to our "European Values" are not refugees. It is people like #Orban. Has #Orban forgotten that, after the Soviet crackdown in 1956, 180,000 Hungarians fled to Austria and 20,000 to Yugoslavia?